The median shares for 5 of the top 5 B2B content publishers is 803. The median shares for the other 95 popular B2B blogs and sites is 106. Most shares of B2B blog posts take place on Twitter and that network is the primary focus for most B2B blogs. However, the top 5 B2B sites achieve significantly more Facebook and LinkedIn shares (both absolutely and as a percentage). These two networks offer a significant opportunity for B2B blogs–in particular product and research news posts for Facebook and practical tips and industry trends for LinkedIn. Pinterest and Google Plus are irrelevant for most B2B blogs, unless you have high quality image content. Short form content dominates the most shared B2B content although on average long form content gets more shares. List posts are the most popular and successful B2B content format, over 30% of the most shared B2B posts are list posts. Practical ‘how to’ and ‘ways to’ posts account for over 10% of the most shared B2B posts. Headlines that appeal directly to the reader using ‘you’ or ‘your’ represent almost a third of the most shared B2B posts. Viral headline structures appear to work well for B2B content. Look to develop quality short form content. You do not need to write long form content to achieve higher shares. Short form content is inherently shareable. One opportunity may be to repurpose your longer form content, or other long form content, and produce well edited, focused, short form content with charts and images. Deeper, longer form pieces of content also work well with an engaged B2B audience and can serve as cornerstone content. Identify the engaging topics in your industry, both the permanent topics of interest and those that are in vogue right now. Write about trending or emerging topics early. List posts work as well in B2B as they do for Buzzfeed. Make sure they’re in your mix (but not the only thing). By contrast quizzes do not appear to work as well in B2B marketing, so these can be lower in your priorities. B2B readers are also consumers: use viral headline structures, use effective trigrams (three word phrases) and promise explicit value. Just be sure you keep your promises. Test case studies with your audience as there appears to be less competition in this content area but industry case studies do appeal to an engaged audience. Look beyond Twitter to Facebook and LinkedIn as places to promote specific content. Use viral headline structures and shares news on Facebook, particularly articles on new products and research. Grow your LinkedIn shares by posting ‘how to’ articles, tips, trends and practical content. Focus on helping people to be successful. If you’re in B2B don’t waste your time developing strategies for Google Plus and Pinterest. Move along. The only exception is if you have great image based content. The mean average can be misleading when looking at social shares as some posts get hundreds of thousands of shares and this can skew the average. The median can therefore be a better figure to look at, the median is the 50% mark ie in our sample 50% of posts got 214 shares or more. We also looked at the 3rd quartile for high performing posts, thus in our sample 25% of posts received more than 821 shares. The data from 100 top blogs and sites was heavily skewed by a small number of sites, most notably B2B publishers and a few top blogs. These sites both publish a lot of content and receive a very high level of shares. We decided to treat five of these as outliers, namely Techcrunch, Inc, Social Media Examiner, Entrepreneur and Moz; and analyze them separately. These sites published 43,656 posts over the last year, compared to 70,865 published by the other 95 sites combined. Thus they represented over 30% of all articles. They also averaged (mean) over 1,375 shares per post. There were a few other sites that had larger average shares such as Buffer with a mean of 2,114 shares per post but they published less content, Buffer published 202 posts in the year, and hence had less impact on the overall sample statistics. It is important to remember this is still a set of some of the most popular B2B blogs including Hubspot, QuickSprout and Search Engine Land. Most posts get far fewer shares than this. When we looked at a random selection of posts last year, the median shares was just 8 not 106. Looking at the data we can draw a number of conclusions about the B2B content that gets heavily shared. 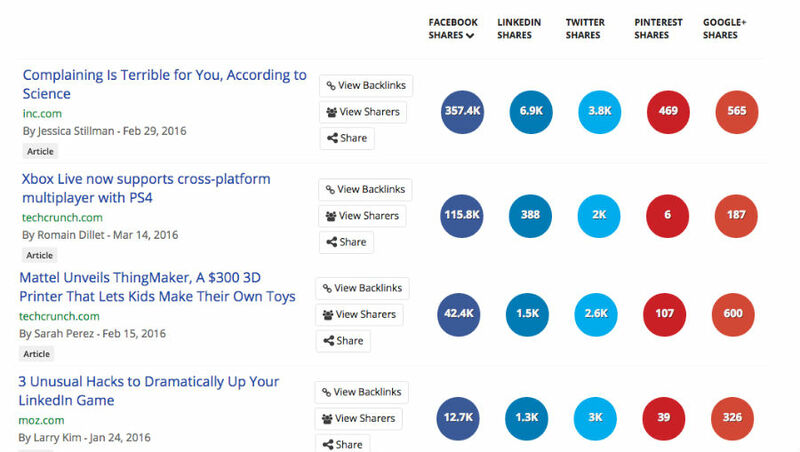 The top 5 sites typically get a very high level of social shares. From our sample we can see that 50% of posts got 803 shares or more. The top 25% got shares of 1,527 or more. By contrast only 50% of posts from the popular marketing and technology blogs received more than 106 shares. A post needed 286 shares to be in the top 25% of posts for the 95 sites. As we mentioned above, it is important to remember these are some of the most popular blog and sites around. The average B2B blog gets far fewer shares. For example, a recent survey we did of 124,876 articles from Hubspot B2B customer sites found that the average (mean) shares of a B2B post were 69 and to be in the top 25% you needed just 56 shares. Thus whilst you may see popular B2B posts with masses of shares, the reality is that achieving over say 60 shares will put you comfortably in the top 50% of all B2B posts. So what does it take to get there? We are specifically looking here at popular sites to see what lessons we can learn and apply to B2B content. Twitter currently dominates when we look at the median shares for the 95 B2B sites and blogs. The dominance of Twitter is even more marked for two of our top sites, namely Moz and Social Media Examiner. Their median Twitter shares were each over 1,800. The consistency of Twitter shares on Moz and Social Media Examiner is remarkable. Their median shares are almost the same as their average shares. It appears that many B2B sites and blogs focus on Twitter as a sharing platform and achieve relatively high Twitter shares relative to shares from other social platforms. Almost half of their shares come from Twitter. However, when we look at the top B2B publishers Twitter shares account to closer to 25% of all shares as they achieve a lot more shares from Facebook and LinkedIn. It does appear that Facebook and LinkedIn may represent opportunities for less popular sites to increase social sharing. The reason larger B2B publishers may do well on Facebook is that news related items and viral style posts perform well on Facebook. In many ways these posts are more akin to B2C news style posts that are relevant to a wide audience. For example, below are some examples of the most liked and shared posts on Facebook from our 100 B2B sites. The top three posts are all variations on news about products and latest research. The last post in the list is interesting as it dramatically outperforms all other Moz posts on Facebook. The headline format is a classic viral post headline. Our research has shown that these headline formats work particularly well on Facebook. We will discuss the importance of headlines more below. It is our view that Facebook continues to grow in importance as a platform for B2B as well as B2C marketers. Content about new product developments or research in particular appear to gain traction on Facebook. The headlines you use for Facebook are also important with Facebook audiences preferring to share viral style headlines. Takeaway: Grow your Facebook B2B shares by sharing viral style headlines and news based articles on products and research. The type of posts that appear to do well on LinkedIn are practical posts that help people to be more successful at work. The Inc site is unusual in they get more than twice as many LinkedIn shares as Twitter shares. This may reflect the nature of the content they publish. Below are example posts from our sample that received more LinkedIn shares than shares from any other network. The sample is consistent with our previous findings that practical posts that help people to improve their work performance get well shared on LinkedIn. Thus posts on mistakes to avoid, tips to improve, or habits to acquire, all work well for B2B posts on LinkedIn. We have also found that posts with the word successful in the headline also resonate on LinkedIn. Takeaway: Grow your LinkedIn Shares by posting ‘How To’ articles, tips, trends and practical content. The data suggests that Google Plus and Pinterest are not that relevant for most B2B technology and marketing blogs. The number of shares is close to zero across all sites. The main exception is the Social Media Examiner site. This site gets significantly higher shares on both these networks than other sites, although if we look at the median, both networks combined account for less than 10% of their total social shares. In our sample there were very few posts that achieved more shares on Pinterest than any other network. It was no surprise to see those that did were image based posts and infographics. Below are some of the posts that received more Pinterest shares than shares from any other network. Takeaway: If you’re in B2B, don’t waste your time developing strategies for Google Plus and Pinterest. Move along. The only exception is if you have great image based content. One surprise from our sample was how short form posts of less than 1,000 words dominated the most shared posts overall. 45 of the top 50 most shared posts and 81 of the top 100 most shared posts in our sample were less than 1,000 words. Thus arguably the top performing content in our sample is short form. This logically makes sense as people are time pressed and want short, quality content. We previously looked at IFL Science as a case study in high performing short form content. However, on average long form content performs better as we can see below. There were only 3,000 posts of over 2,000 words and 18,500 articles of between 1,000 and 2,000 words. Thus you could argue that it is no surprise to see more short form content in the top posts as it represents over 80% of all content. This is true but in the top 50 posts, 90% are short form. In the top 100 posts short form represents about 80% of the articles. I think we have to treat averages with caution as averages can be very misleading. It is my view that the average shares for short form posts are dragged down by the sheer volume of poor quality short form content. As we can see above there were over 90,000 short form posts in our sample, compared to just 3,000 posts of over 2,000 words. My instinct is that, on average, long form content is of a higher quality. It is hard work to write over say 2,000 words and hence these posts are likely to be more in-depth and of a higher quality than say the average short form post. Thus in my view, whilst long form posts perform better on average, there is a significant opportunity for short form content. To make something shorter requires time to reflect, edit and develop images or charts. I am personally conscious that if I had another week to work on this post I could make it more succinct and more valuable to the reader. One short form opportunity might be for someone to take this post and create a much more succinct and skimmable version of the findings or an infographic. Some posts are more suited to short form posts such as news items. Search Engine Land’s news item on Google dropping right hand ads was very short but still received over 24,000 shares as it was significant news people that wanted to share. One of the best sites for short form content is IFL Science which frequently uses a single image or video to explain a scientific concept. Read our previous post on how IFL Science is nailing it with short form content. A variation on the use of images is to create an infographic. This is a good example from Larry Kim on 24 daily habits to make yourself smarter which received over 18,000 shares. Takeaway: You do not need to write long form content to achieve higher shares. Short form content is inherently shareable. One opportunity may be to repurpose your longer form content as focused short form content. That said deeper longer form pieces of content work well if you have an engaged audience. We created a subset of data consisting of the top 4,500 posts. These were all posts that received more than 3,000 shares. The aim was to see what we could learn from the most shared B2B content. In our new data set of top performing B2B posts there were no examples of quizzes or ebooks. There was a post on how to promote your ebook that received 3,900 shares and one on how to generate leads with quizzes that received 3,300 shares. However, there were no actual quizzes or ebooks in the top 4,500 posts. There were 28 infographics in the top 4,500 posts. Generally there were also few case study posts, only one of which was in the top 4,500 posts with 3,600 shares. We found the 4,500 top performing posts were dominated by just a few common formats, primarily list posts and ‘how to’ posts. This is exemplified by content from sites such as Social Media Examiner where the top posts are overwhelmingly list posts and ‘how to’ or Guide posts. We found that list posts are still a significant percentage of most shared posts. 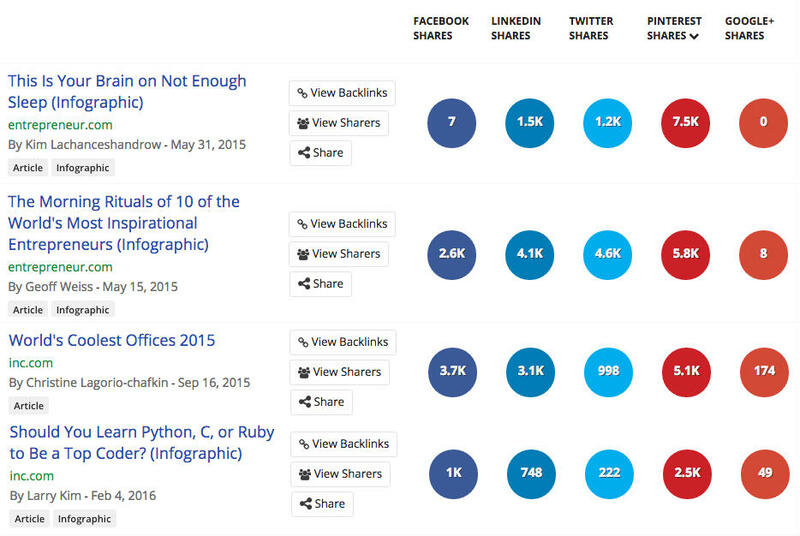 Of the top 4,500 most shared posts that we analyzed in detail a third were list posts. We may love to hate them but list posts still work in terms of achieving shares. There were 1,429 list posts in the top 4,500 most shared B2B posts. 242 of these were lists beginning with 5 and 177 were posts beginning with 10. The top 177 list posts beginning with 10 averaged 6,398 shares and 242 posts beginning with 5 averaged 5,214 shares. Takeaway: I hate to say it but lists appear to work as well in B2B as they do for BuzzFeed. They should be in your mix (but not the only thing).. Practical posts such as “how to” and “ways to” posts were also common formats amongst the most shared posts. There were 130 how posts, 280 “how to” posts and 203 “ways to” posts in the top 4,500 posts. The top 280 “how to” posts averaged (mean) 5,410 shares. Takeaway: Practical posts that help readers improve what they do work well as B2B content, particularly on networks such as LinkedIn and Twitter. It was no surprise given we were looking at the marketing and technology sites to see topics such as Social Media, Facebook and Google appearing frequently in the content published. In the top 4,500 most shared posts from our sample, 257 had social media in the title (excluding Social Media Examiner), 203 had Facebook in the title and 201 had Google in the title. In any industry there are topics that are in vogue and there are perennial topics. News about Google and Facebook will always be interesting to a marketing and technology audience. Last year Big Data was very much in vogue and this year there is growing interest in AI. It is important to understand what the permanent and trending topics are for your industry. Takeaway: Writing about trending topics and stories in your industry represents an opportunity to increase your shares, however, you have to get in early . 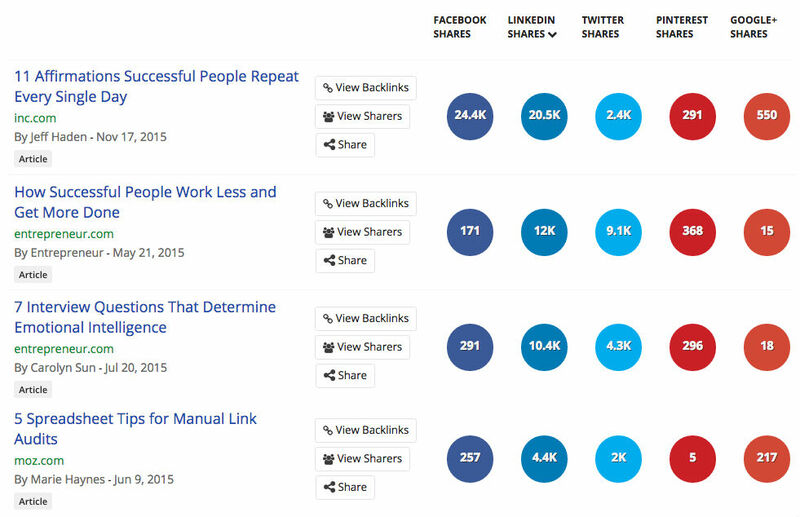 Use tools such as BuzzSumo Trending to track trending topics and news in your industry. We looked at the 4,500 most shared articles and examined the headlines and headline structures that achieved a high level of shares. We have seen above how 1,429 were list posts and the headline started with a number. The most shared posts started with the number 10. These headlines make a direct appeal to the reader. These promise personal improvement ie, being more professional or smarter or productive. They’re aspirational. These headlines appear to work particularly well on LinkedIn where the best way to be successful with your post might be to use the word successful in the headline. In our recent research we identified a headline structure that appears to help posts achieve high levels of shares. You can read the full details in our post How to Write Viral Headlines. This headline structure includes 5 elements as shown below. These headlines make very explicit the content format such as a list or a story. They use an emotional word to attract you such as amazing, surprising, or shocking. They are very clear about the content type. you will see images or quotes or facts or tools. They typically focus on a topic of interest which can be a trending topic. Most importantly of all they make a promise, in this case the charts will turn you into a baking whiz. Notice that at least 5 of these make the specific promises to improve your business, productivity etc. The last one has a slightly different promise — that these 7 questions will help you determine the emotional intelligence of someone at an interview. Takeaway: B2B readers are also consumers, use viral headline structures, use effective trigrams and promise explicit value. Just be sure you keep your promises. Our analysis of the top 100 B2B marketing and technology blogs indicates that the following steps can boost the shares of your B2B content. Look to develop quality short form content. You do not need to write long form content to achieve higher shares. Short form content is inherently shareable. One opportunity may be to repurpose your longer form content as well edited, focused short form content with charts and images. That said deeper longer form pieces of content also work well if you have an engaged audience. Write about the engaging topics in your industry, both the permanent topics of interest and those that are in vogue. Write about trending or emerging topics early. By contrast quizzes do not appear to work as well in B2B marketing. B2B readers are also consumers, use viral headline structures, use effective trigrams and promise explicit value. Just be sure you keep your promises. Test case studies with your audience as there appears to be less competition in this area but case studies do appeal to an engaged audience. Share viral headline structures and news on Facebook, particularly articles on new products and research. Grow your LinkedIn Shares by posting How To articles, Tips, Trends and practical content. Focus on helping people to be successful.